SBCC Presents the finest of the rising rock scene! 4th Labyrinth kick the night off in flamboyant style with their unique take on 70s inspired prog, before local favourites False Hearts deliver modern rock at its very best. Finally the incredible Gin Annie head straight from Planet Rockstock to make their first ever appearance at a Cambridge venue; the perfect mix of heavy guitars and attention-grabbing hooks, you don’t want to miss out on this one! 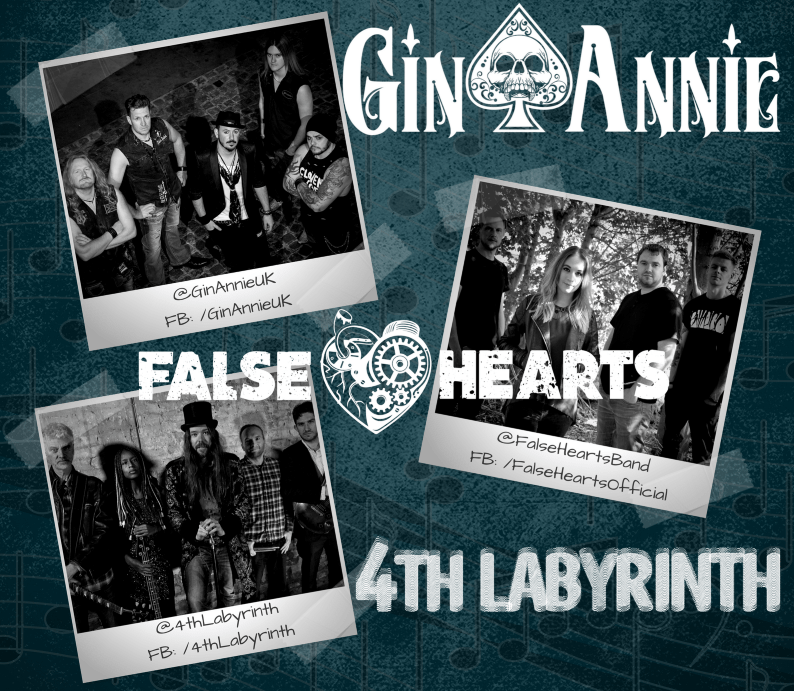 Gin Annie: Gin Annie are a hard/melodic rock 5-piece from Wolverhampton UK, delivering heavy guitar driven songs whilst maintaining a melodic vocal style complete with hook-laden choruses. Following the release of their debut EP, New Bad Habit, the Black Country rockers introduced a new guitarist (Brian Green) and bassist (Phill ‘Hammer’ Burrows) to beef up their already huge sound. False Hearts: Delivering modern rock with a fiery finesse, False Hearts united in 2016 and soon took the Cambridgeshire music scene by storm thanks to their unique and compelling take on passion-driven, female-led rock. With experience in ventures ranging from rock bands to music studios to full-blown orchestras, False Hearts’ unrelenting drive and multifaceted approach to the art of music has captured the hearts of audiences and critics alike, carrying them from stage-to-stage at some of the country’s most-beloved venues and festivals. 4th Labyrinth: Known for their engaging and witty live shows, 4th Labyrinth’s highly approachable rock sound makes them incredibly versatile, keeping the listener’s attention throughout. From heavy guitar riffs to the most delicate heartfelt ballads, from progressive rock monsters to future sing along classics, the band is on a mission to bring 70s inspired rock music back to where it deserves to be.